So the next indie review is here. 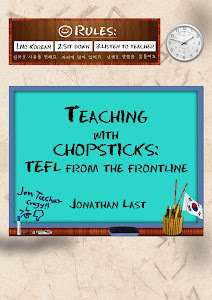 Teaching with Chopsticks by Jonathan Last. Another book you’re not likely to see on the shelves of WH Smith, Tescos, or even Waterstones. Once again this is a book about teaching English as a foreign language that’s a must if you are or ever have been a TEFL teacher. Or even if you’re thinking about taking that year out and would like a heads up on what it’s really like. More so than Stranger in Taiwan because this is essentially all about teaching. In fact that’s the great thing about this book. Not only does it include the obvious drama of overcoming initial feelings of loneliness to create a new set of friends; acclimatising to a foreign environment, and plenty of nights down the local bar… it’s also very much about the job you have to do when you get there. It’s primarily about the experience of being thrown into a room with a group of children, staring up at you: expecting you to be their teacher; then gradually learning the skills needed to cope with all the ups and downs of the work. Jonathan Last went to Korea with the intention of writing a book about his teaching experiences and it shows. The detail he puts in and the way the plot moves around his ever changing attitudes towards the job and Korea in general… this is no memoir, you’re actually there with him, which makes for great reading. Me: “Hi, my name is Jon. Those are the bolder ones; the more shy specimens just hang back and observe me from afar, in huddles. Uniformly black-haired creatures running around like some sort of sped-up negative of The Village of the Damned, an alien language filling the air and plastered all over the walls – I’ve definitely arrived. (If you’d like to read the first 2 chapters in full you can get a sample from the Amazon page). The only problem with this book is that it isn’t available in print. It’s been published by a small company specialising in e-books called e-books publisher. One day I hope to see it picked up by a larger company because it definitely deserves a wider readership. This book sounds like a fun read. Thanks for sharing your review of it.